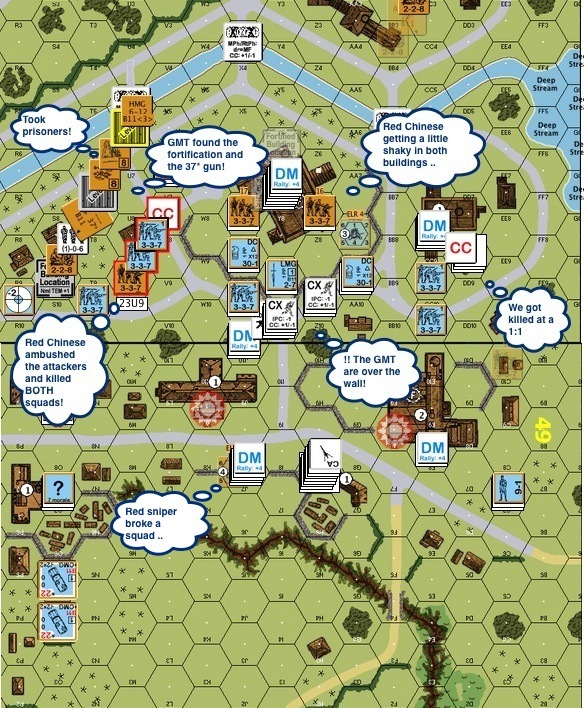 Posted on August 24, 2014 by Hong Kong Wargamer Tagged AARAdvanced Squad LeaderASLBoard Gameboard wargameCarl NogueiraChinaHong KongRed ChineseVASL	Comments5 Comments on DB081 Lack of Discernment AAR – Defending! 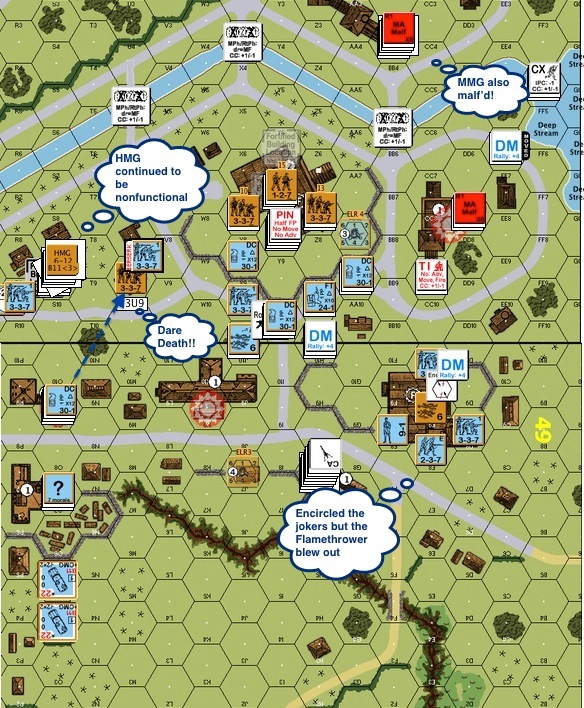 DB081 Lack of Discernment AAR – Defending! 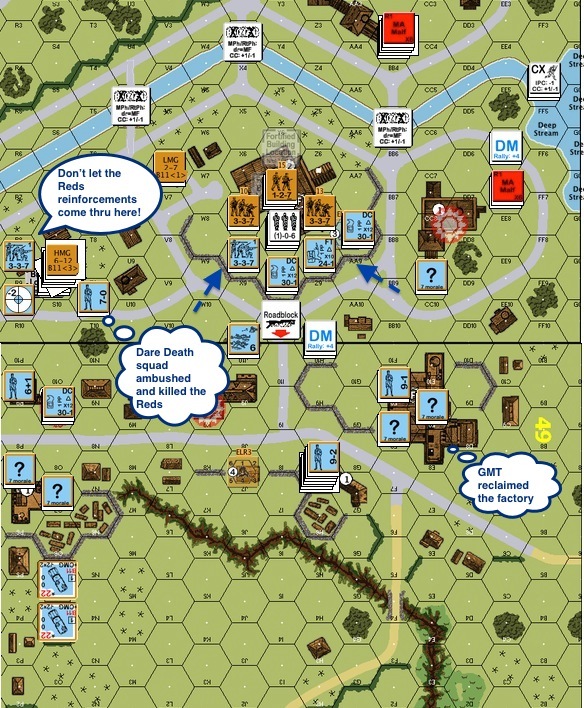 Here’s the AAR of when I played this scenario as the attacker against Carl Nogueira. Now that I got a chance to see how the grownups do it, Carl gave me a chance to put my learning to the test. He let me play this again, with me defending as the Red Chinese this time. The above is my attempt to draw a pentagram with imaginary fire lanes when setting up the defence. Carl put his defence all upfront. I am not so confident. Just so everyone knows, this scenario has a variable ending depending on when the GMT can capture enough multi-hex buildings to get the points required by the end of Turn 4 to 7 while suffering no more than 24 CVPs. The multi-hex buildings on the south of the canal are worth 1 point each, the ones to the north are worth 2. The two bigger buildings on the south I labelled “Factory” are worth 2. The first target for the GMT is to get 8 points by the end of Turn 4. However if the Reds reinforcements come in south of the canal, that requirement for the GMT falls to 7. Carl put his defence up front. I wasn’t so confident. I thought the weight will come from the right and that the GMTs would be crossing the canal up the top right corner to grab at the 2 point buildings. 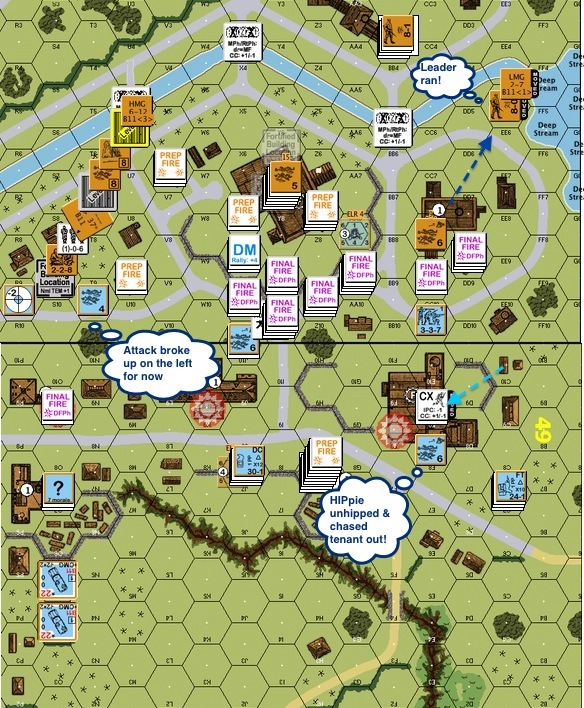 I couldn’t give up the use of the single hex multi storied building on the left, that was where I placed my HMG, a quick fire 37* gun and ground level fortifications. I put another fortification in the middle of the factory where my commissar sat. I got another fortification hex behind him as “the Alamo”. He would expect the Red Chinese “death star” on the left so I didn’t bother HIPing it. I did however HIP’d two half squads on the right to help with the defence. The MMG and the 70* gun were across the canal to the North. In a way the longer the big gun laid unfound, the better it is. Notice Carl got a nasty death star : 2 MMGS + HMG + 9-2 on level 1 of a building. Okay, talk is cheap, let’s see how all these work out. Red Chinese Turn 1 : The GMT pushed very aggressively into and in some case past the first line of buildings. The Reds death star exchanged shots with the powerful GMT one and didn’t fare too well. The GMT staged for the attack on the (middle) factory. Yes, the Reds “sulked” and skulked as well into the factory and later advanced back out. GMT Turn 2 : GMT attacked across the street! They quickly found the 37* gun on the fortified ground floor in the building to the left. The broken attacker was taken prisoner and was ushered into the building quickly. The Reds position in the factory and in the building to the right looked shaky. Broken Reds quickly piled up. There were two close combats. 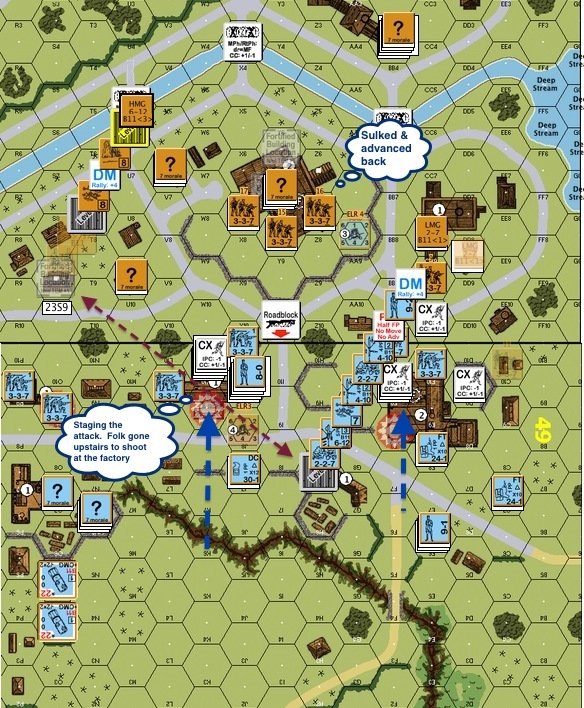 The 2 GMT squads to the left was ambushed by the Reds and were both KIA’d. The GMT squad to the right fared better, it killed the Reds squad and flanked the building. Red Chinese Turn 2 : The GMT had pretty much captured the building on the right. 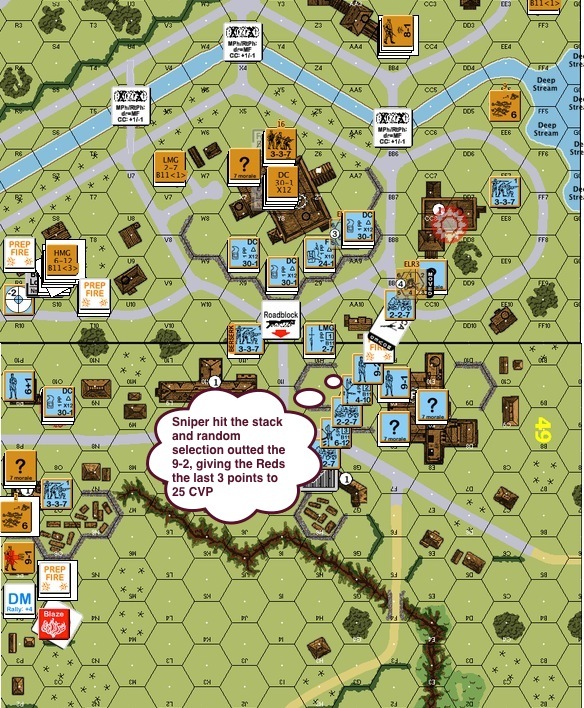 The Reds leader decided to make a run for it with the LMG and head for the canal! A HIPpie on the right popped out and headed for the factory on the right, going after the broken GMT squad and absolutely intend to be a nuisance. The factory being 2 points, Carl had to comeback and root the little Reds squad out. I hope to survive past Turn 4 and receive the GMTs across the canal. Red Chinese Turn 2 (contd) : The Reds took another GMT squad prisoner and dragged them into the (middle) factory. The broken Reds squad ran after their leader to the right. 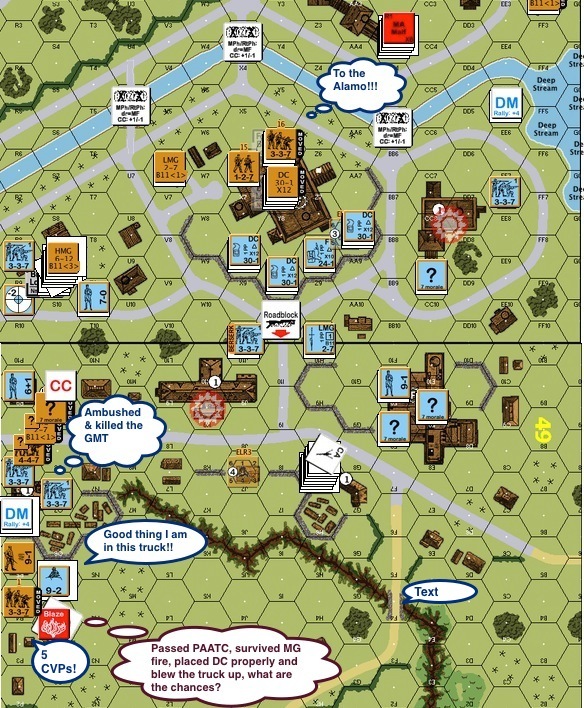 The GMT now had 5 points against the required 8 needed to win the game in Turn 4. GMT Turn 3 : The GMT went back into the factory to the right to reclaim it. A GMT Dare Death squad led the charge to the left! May be the GMT was looking to cut off the middle factory from the left as well. 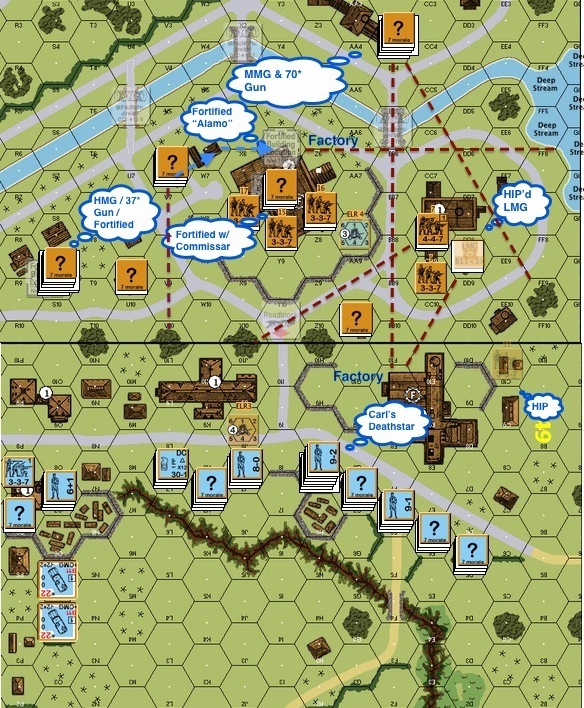 GMT Turn 3 (contd) : Prospects for the Reds weren’t looking up. Their “death star” on the left was slowly getting cut off and surrounded. The GMTs were all lined up outside the middle factory. The canal was ready for a cross over. The GMT got squads lined up against the left in case the Reds send reinforcements in from south of the canal. Reds Turn 3 : Turn 4 was coming up and doing the usual was not going to help me survive. I need some GMT CVPs fast. The GMT armoured trucks hadn’t been moving from the bottom left at all. Trap or not, I had to go for it. Each armoured truck gives me 5 CVPs. The one with the armoured leader gives me another 3 CVPs for a total of 8. So the Reds moved in concealed. One of the Reds squad survived Defensive Fire from the GMT death star (broke one of the guns as well), passed the PAATC check, placed its demolition charge properly and .. Blew up one of the armoured trucks with no survivors. Too bad the armour leader was in the other truck! Another Reds squad moved in, ambushed and killed a GMT squad in close combat. This created a funny situation. Since the Red Chinese reinforcement entered south of the canal, the GMT build points requirement in Turn 4 dropped from 8 to 7 which the GMT now had. The GMT would need to rescue the prisoners before the end of Turn 4 to win the game. Otherwise if the game “ends”, the Reds would realise 26 CVPs (+4 CVP bonus from the prisoners) instead of 22 and 2 CVPs more that what the GMT were allowed to lose. GMT Turn 4 : GMT squads started off a new turn prep firing away. One of the shots invited a Reds hot sniper that hit the GMT death star. A round of random selection nailed the GMT 9-2 leader in a stack of 4. 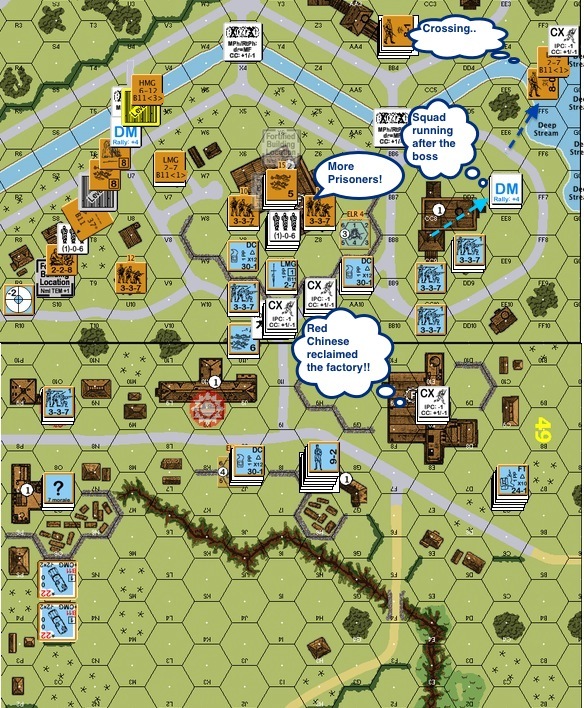 This gave the Reds the 3 CVPs need to reach the 25 CVPs to win the game (29 CVPs with the prisoners). Great game! This entry was posted in Game Play, Uncategorized and tagged AAR, Advanced Squad Leader, ASL, Board Game, board wargame, Carl Nogueira, China, Hong Kong, Red Chinese, VASL. Bookmark the permalink. Sounds like a good game, you got hot when you needed to. Thanks Ian. I am lucky in this one as well especially with the final sniper shot! You have to love it when a sniper nails the one key counter in a huge stack….